Ver-tech apartment compactors are designed for installation under trash chutes in apartment buildings, hospitals, nursing homes, or high rise office buildings. These models are simple to install in new and most existing trash rooms and are extremely safe and easy to operate. Standard features include keylocked pushbutton controls, photocell start systems, and safety interlocked access doors. "Full Container" indicators alert staff when to exchange containers and can be connected to a central control office. Ver-tech apartment compactors let you save labor and space, reduce trash disposal costs, and improve building sanitation and appearance. Controls and enclosures are all U.L. Listed. 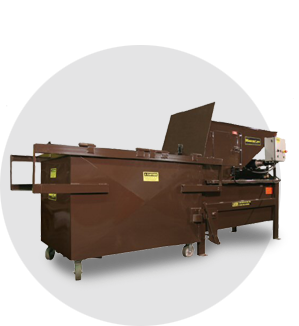 The Model AC-30 Apartment Compactor generates 25,134 lbs. of force to compact trash tightly into a two cubic yard compaction container. 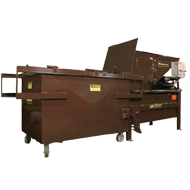 The compactor is less than 71" long and can be ordered with the operating controls mounted on either side of the compactor to fit your trash room. The one-sided container latching system is simpler and easier to use than the double turnbuckle latches used by most manufacturers. It takes about 1/4 as much time to change a container with the single side latch, thus reducing the chances of spillage from trash being dropped down the chute while an operator is changing a container.